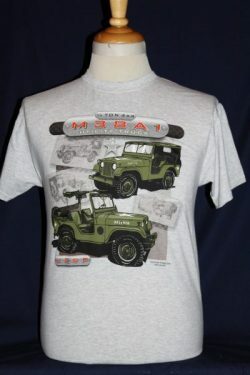 The M38A1 Jeep Utility Truck T-shirt is a single sided print in grey. Front Design Only: Two views of the M38A1 in military green superimposed over faded photographs of the same vehicle. 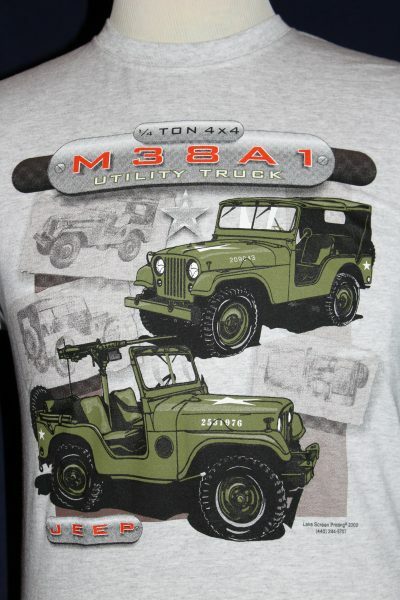 The M38A1 is a 4x4 1/4 ton vehicle. JERSEYS 5.6-oz. preshrunk heavyweight 50% cotton 50% polyester shirt. It is taped from shoulder to shoulder, has a cover seamed neck and is double needle hemmed for insured durability. This shirt will wear well and retain its original color and decoration after multiple washings. Note, we use the best quality shirts available!